With Austria′s population getting increasingly old - look at any street in Vienna: little old ladies with ugly dogs - there are relatively few attractions around that will appeal to children. The MuseumsQuartier aims to be attractive for all people, but particularly for a young and fashionable crowd. Therefore, when the new museum-district was designed, a corner for the youngest visitors was proposed. Today, there are three attractions in the MuseumsQuartier that were specifically designed for children. 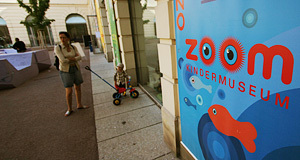 The "Zoom Kindermuseum" offers two temporary exhibitions a year that target children of the ages of seven to twelve. The exhibitions deal with a specific topic from science, art or lifestyle. Younger children will find playgrounds that the designers call "installations" in a boost of arty self-confidence. Children between the ages of eight and fourteen can go to a media lab and experiment with animation movies, sometimes under the supervision of "real" artists. The idea for the Zoom Kindermuseum dates back to 1992, when the art historian Claudia Haas suggested to built a museum for children modelled after such projects in the US. The new MuseumsQuartier finally agreed to provide some 600 square metres of space for the project. When it was opened in a provisory location in 1994, it soon became obvious that the space was not sufficient to satisfy the demand. When the Zoom Kindermuseum was finally opened in its permanent location in 2001, it got almost three times the space that the original plans had intended. This office occupies some 170 square metres of space in the MuseumsQuartier and is a funny mix of a playground and information spot. It provides information on activities for children in Vienna - and some facilities for the little ones to become active right away. The information material provided considers interests of children between the ages of three and 13. The Kinderinfo is located just next to the Zoom Kindermuseum. The theatre for children occupies almost 1,000 square metres and two performance rooms that seat 80 and 140 people, respectively. In addition, there is a games corner and a seminar room. As the name says, the Kindertheater aims to provide productions that appeal to children and young teenagers. The origins of the Kindertheater go back to Vienna′s independent theatre-scene, that tried to establish a children′s theatre for a long time. In 1997, politicians finally tried to incorporate this idea in the MuseumsQuartier. A "Children′s Creativity Centre" was planned. With the ever-lasting struggle for the MuseumsQuartier, the opening did not happen until 2002.